Saturday was a busy day along our little one and a half lane, country road. More people work at the hatchery than live on this road. When the local salmon festival occurs, thousands visit in the span of 6 hours. Although the people arrive in force to view the salmon, their numbers don’t come close to the population of turkey vultures filling the sky. Like the people, the vultures also come for the salmon. The turkey vultures are drawn in with their keen sense of smell. This may also be why the visiting local tourists don’t linger for too long. If you think a spawning salmon looks gnarly, you should smell them. The malodorous rot of spawning salmon surely does not evoke a sense of bliss. Giving thanks today for the turkey vultures featured in Wings of Autumn post. 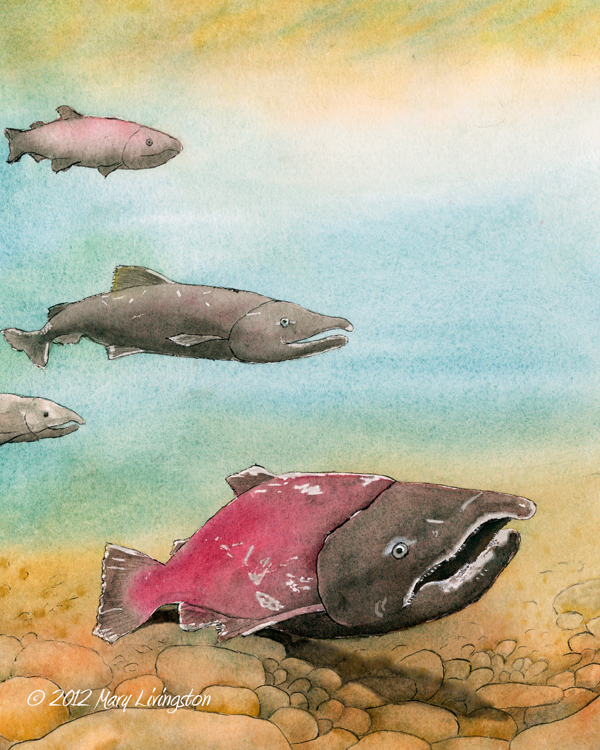 This illustration for a children’s book features Chinook salmon. The salmon begin dying and rotting once they leave the ocean. By the time they reach their spawning grounds they are in rough shape. This entry was posted in Balance, Bliss Tips, Illustrations, Nature Art, Salmon and tagged Art, autumn, Children's Books, Chinook, Drawing, fall, salmon, spawn, Turkey Vultures, Watercolor by MaryALivingston. Bookmark the permalink. This is a beautiful piece. Thank you for sharing it. Thank you. Wow, I just checked out your blog, nice. I am new to watercolor and appreciate seeing the beautiful work out there like yours. Thanks for picking up on my post concerning the Chinook run. I’ve looked in at your blog posts and enjoy what I see and read. Ah, the watercolors! I am always amazed to see how their physical appearance changes while in the process of death. Just Beautiful! Love the soft colors. Thank you, they are amazing to watch. Awe, thanks. 🙂 Same thoughts here when I visited your blog. I look forward to exploring some more. Thanks for stopping by.